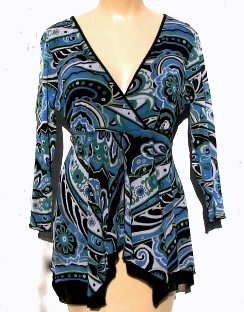 This wonderfully loud reproduction 70s style blouse has a wonderful splash of colors. Most of the colors above are true except the green which is a kelly green, not as dark as it appears above. The white is brighter too, a true white. The entire blouse is a bit brighter; I'm getting used to a new digital camera. The blouse isn't quite as long as the photo indicates. It does come over the hip area just a bit on the sides. The lightweight blouse is made of nylon. The psychedelic top layer has a nylon black lining underneath. The 70s style blouse is about a size 4/5. There is a back tie that makes it adjustable. The chest area will fit a 32" to a 36" chest. The sleeves are 3/4 length.